I love tea, especially hot tea. I have English ancestry, which must be why I enjoy it so. During the past five years, I’ve begun to use loose leaf tea over tea bags. I like blending my own, using a mix of herbs, dried flowers, dried berries and green tea leaves. I use a metal tea ball to contain the mixture while it steeps in my white porcelain teapot. 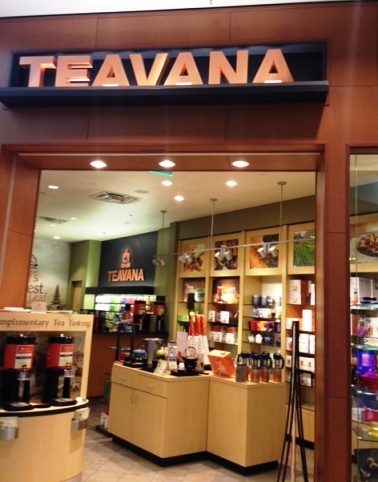 When my friend, and Keller Williams colleague, Janet, told me about Teavana, I looked forward to visiting for a first. This afternoon, I got that chance. 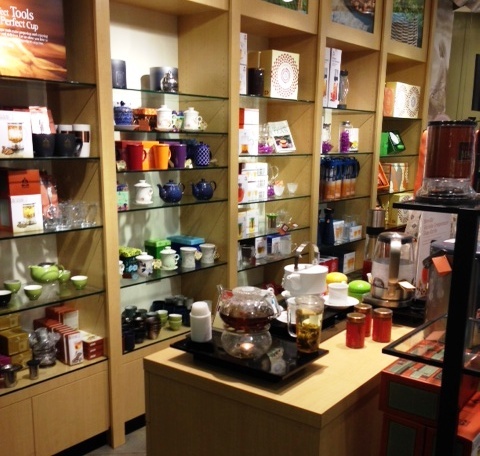 Teavana is an inviting little shop located in the Battlefield Mall in Springfield, MO. The aroma of freshly brewed tea wafted out as Greg and I approached the entrance. We were greeted by a friendly sales associate who offered us several samples of hot and cold tea. All were delicious! The front part of the store was filled with an assortment of teapots, cups, kettles, teamakers and infusers. Someday I’d love to own a Japanese cast iron tea service. But today, my focus was on Teavana’s high quality loose leaf tea. Behind the back counter were huge tins with a variety of green, white, Oolong, black, maté, and Rooibos teas and herbal infusions. Ahhhh…..the delicate scents filled the air as the associate removed the tin’s lids and stirred the air. I had a difficult time choosing, so I bought several kinds including Blueberry Bliss, a fragrant blend of blueberries, grapes, black currants, hibiscus flowers and green rooibos tea. Perfection. I also purchased a pineapple blend, a raspberry-lemon maté, and high grade black, green and Oolong teas. I thoroughly enjoyed my visit. After I arrived back home, I did research on the company. Founded in 1997, Teavana believes in the importance of a life well lived. Centered on the philosophy that balance, meaningful experience and everyday luxuries are essential elements of such a life, Teavana desired to create a place where people could step back from the frantic pace of the world and enjoy fresh, high quality tea. They take tea seriously and they are passionate about the entire sensory experience found in a good cup of tea. Teavana’s philosophy and mission are so in line with what I desire to offer, through my dream called Rivendell. I understand why I was drawn to this company, and even why I am drawn to tea as well. It goes beyond being a refreshing beverage. Preparing an aromatic cup of tea, sharing that tea with a friend or loved one, involves heart, simplicity and ritual, all of which are important to me. I am looking forward to my backyard garden renovation being completed, which will signal the launch of the Rivendell experience. I am, literally, creating Rivendell in my own backyard, initially. I envision sharing this space in myriad ways with guests. As part of the experience, there will be freshly brewed tea offered. I believe I have found my source for the tea. Teavana and Rivendell….what a beautiful partnership!